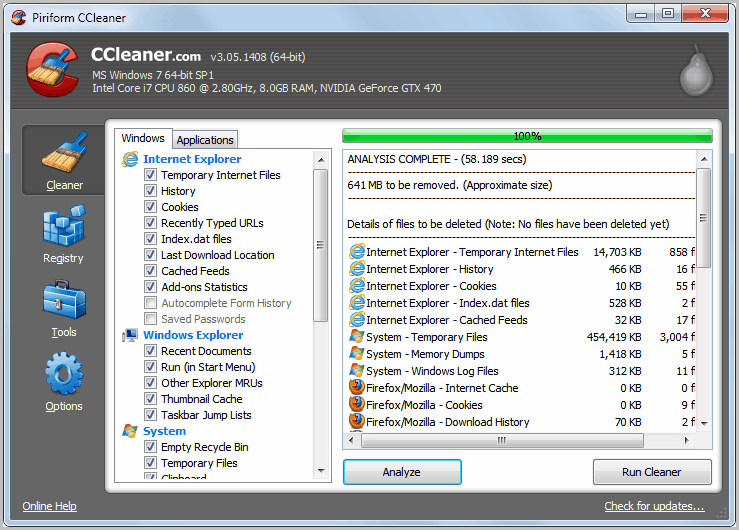 CCleaner is without doubt one of the most popular Windows system maintenance tools. It is not just one single feature that makes the application that popular, more a combination of several features. It is effective when it comes to cleaning temporary files, updated regularly to support new applications or software versions, and offered as a portable version and installer. The developers Pirisoft have updated CCleaner today, bringing the latest version to 3.05. The new version introduces support for new and updated programs and improvements in the scanning and cleaning functionality. Interested users can take a look at CCleaner's version history for the full list of changes. Probably the biggest additions are support for the recently released web browsers Internet Explorer 9 and Mozilla Firefox 4. Internet Explorer users in addition can now clean cached feeds and add-on statistics, as well as invalid Browser Helper Objects. The developers have furthermore added support for iTunes cookie management, cleaning of obsolete Windows firewall rules, and support for more than 20 different programs, from the popular gaming platform Steam to the voice communication software TeamSpeak and Ventrilo. A scan for obsolete Windows Services has been added to the Registry Cleaner. Added support for Internet Explorer 9, Firefox 4.0, Internet Explorer Cached Feeds cleaning, Internet Explorer Add-ons Statistics cleaning, iTunes cookie management, Opera cleaning for saved/opened directories paths. Improved Firefox/Mozilla Saved Password cleaning, Intelligent cookie keeping functionality, Registry cleaning for Obsolete Software, Registry cleaning for Unused File Extensions. Added Registry cleaner for Windows Services, cleaning for obsolete Firewall Rules, detection of invalid Browser Helper Objects, new environment variables for user documents. (i.e. %CommonDocuments%, %CommonMusic%, %CommonPictures%, %CommonVideo%, %MyDocuments%, %Documents%, %MyMusic%, %Music%, %MyPictures%, %Pictures%, %MyVideo%, %Video%). The new cleaning options are available under the Cleaner menu in the program. CCleaner scans the system for supported programs and will display all applications that are installed on the system in the listing. It is still recommended to use the third party program CCleaner Enhancer to add support for additional programs to the software. CCleaner 3.0.5 is available from the developer homepage over at Piriform. The program is compatible with all 32-bit and 64-bit editions of Windows XP, Windows Vista, Windows 7, Windows 2000, and the corresponding server operating systems. Thanks for the heads up. It totally did not click in my head that the new Firefox 4 format would need an updated CCleaner.